My fourteenth ground of 2017 was on Sunday 17th April at Pavilions in Runcorn, Cheshire. The match was Runcorn Town vs. Barnton in the North West Counties League Premier Division. Pavilions is located in an industrial area close to the banks of the River Mersey. It is bordered by a chemical site to the west, a vehicle hire centre to the north, the A557 Weston Point Expressway to the east and a former football ground and cricket pitch to the south. The spectator areas are split across the western and eastern sides of the ground. There is a small sheltered area in the south-east corner with the clubhouse next to this which includes a bar and the players dressing rooms. 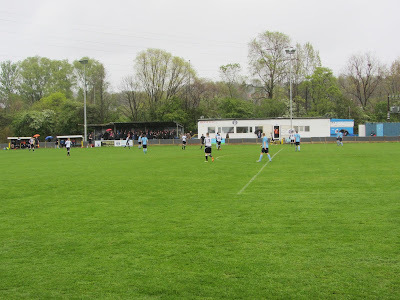 To the right of this three rows of covered terracing - this stand was originally larger but the back section has been cordoned off limiting the space. The two dugouts are split by the half-way line and the remaining half of the east side is uncovered standing. 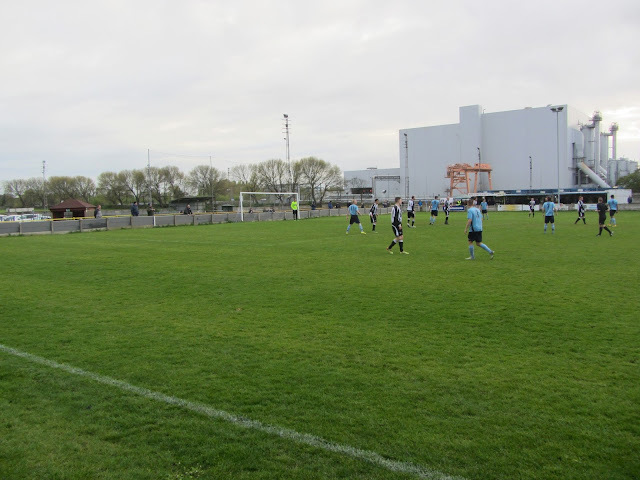 With the curve of the A557 the area by the pitch gets progressively narrower as you go north and the northern end itself just consists of a narrow walkway behind the goal. The western side has a club shop and tea hut in the south-west corner and then an area of covered flat standing. The corrugated iron protection in these areas has seen better days so wasn't ideal for the wet weather on the day. The longest stand in the ground is an all-seater structure which straddles the half-way line. As with the opposite side of the ground the northern section of this side is uncovered standing. Behind the southern goal there is a narrow walkway with the car park a level down from this. Directly behind the car park is an overgrown former football ground with one stand still remaining. Heading south from here takes you to the cricket pitch and the Pavilions Club itself which gives the complex its name. 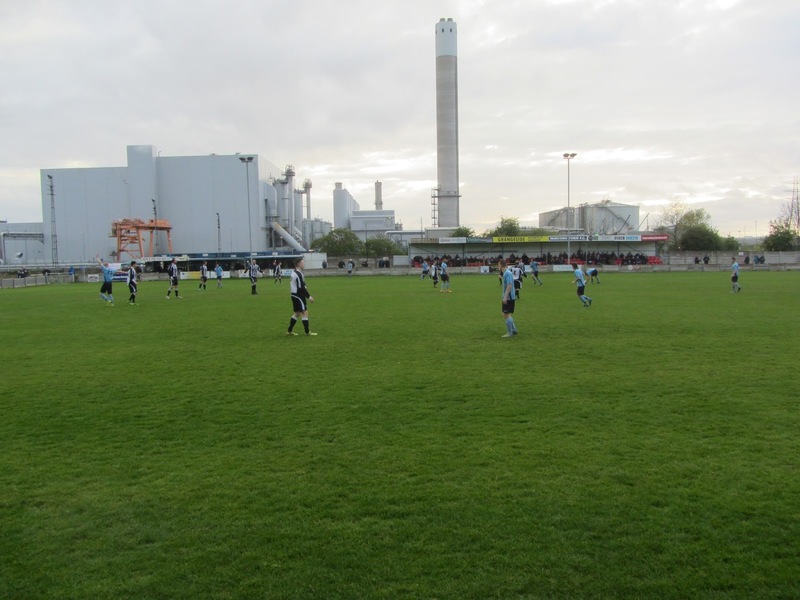 Runcorn took the lead in the 16th minute when a penalty was awarded for a foul on the edge of the box. Craig Cairns shot the spot-kick straight down the middle. The remainder of the first half was a drab one played out in torrential rain which didn't help proceedings. The rain eased off towards the end of the half allowing a couple more chances - in the 41st minute a Runcorn corner was cleared off the line and on the stroke of half time Cairns had a goal ruled out for offside. The hosts came sprinting out of the blocks in the 2nd half and barely a minute after the restart went 2-0 up when a ball into the box found Mark Reed. The Barnton keeper saved his effort and a follow-up from Cairns but the ball then fell back to Reed and it was third time lucky for Runcorn as the ball ended in the back of the net. The two goal lead became three in the 55th minute - Simon Thelwell played a terrific 40 yard ball from the back which put Craig Cairns in on goal and he slotted past the keeper. Reed came close to grabbing his second in the 71st minute when he won a 50-50 tackle with the keeper but his goalbound shot was cleared off the line by a covering defender. A couple of minutes later Barnton got a consolation as Jason McShane dinked a curling effort into the bottom corner from 25 yards out. This was against the run of play and the respite didn't last long as Runcorn added another goal in the 76th minute. The one was a stunner worthy of a much higher level than the North West Counties League - the hosts played out from the back with a slick passing move which culminated in a cross from the right and a superb scissor kick from Mark Reed from 12 yards out which flew past the keeper. Two minutes after this Joseph Holt was put clean through but a good save from the keeper prevented a 5th goal for the home side. Barnton can count themselves fortunate the score was kept to 4-1 as Runcorn were brilliant going forward in the 2nd half and could've had more.